I decided to go back and read this 1978 book thinking it would be an interesting parallel between what happened within evangelicalism in the 50s to the 70s and what is happening today within fundamentalism. It was indeed very interesting. 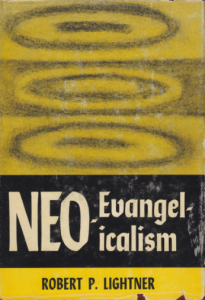 Many of the same reasons that caused the neoevangelicals to leave evangelicalism are being repeated by the younger fundamentalists who are leaving their fundamentalist heritage. Though inerrancy was foremost in the final outcome (which is now in incubation in young fundamentalists), other issues were prominent: a dislike for a (supposed) negative fundamental mentality; a yearning for academic respectability; increased social involvement (second only to inerrancy); a dialogue with more liberal thinkers; a special appreciation for neo-orthodoxy; a breaking down of denominational names and barriers; a return to creedal Christianity; an increasing dislike for personal and ecclesiastical separation; an emphasis on the basic gospel over “non-essentials”; a neglect of the doctrine of total depravity; and increased use of “culture” as an interpretive tool. Lightner’s first edition came out in 1965 and then this volume was updated in 1978. His reflection on the progress of the new evangelical departure over thirteen years is also interesting. Basically, Lightner says (and quotes neoevangelicals themselves) that the younger men went further than anyone ever expected them to go. Even Richard Quebedeaux (the father of “young evangelicals”), writing in The Worldly Evangelicals, in 1978, (which is his own critique of his position written in his 1974 book, The Young Evangelicals) says, “I am not quite as optimistic and uncritical in treating the evangelical left as I was five years ago. At that time I assumed that evangelicals could be genuinely faithful to the Gospel . . . . However, now that this liberalizing tendency among evangelicals is readily apparent and growing, I’m no longer certain that it’s a good thing at all” (p. 196). The problem then is the same as the problem now—an experiment made on a generation of young people and churches cannot be reversed when it has obviously failed. I am hoping against hope that this price is too high to experiment with again.